Lean Reflections: Snow and sleet delaying the post office? Snow and sleet delaying the post office? I ran out of stamps the other day and didn't feel like making a special trip to the post office. We've had below-zero temperatures here lately, and it's warm and toasty in the house. 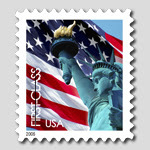 So I took the postal service up on its offer to order stamps from their website. When I've ordered them by mail before, I got them next day. The mail carrier just takes the letter back to the post office and they give him some stamps to drop off on his next trip. Should be the same on the web, shouldn't it? Just a quick e-mail authorization to the local post office, and they can do the same thing as they did for the mail order. Why am I so trusting? I'm still sitting here waiting for my stamps. I could have been to the post office a hundred times by now. If they'd sent them via UPS they'd be here already. I know the post office has been trying to do better for its customers, but they are really missing the mark this time. UPS is not guaranteeing their 2 day air right now either because of the weather. I just had a late shipment of supplies from back east. The supplier was kind enough to refund the excess shipping charge, but they said UPS claims "act of God" nulls the air time guarantees.